iM3 winged elevators are light-weight yet extremely durable. The sharp tapered winged tip allows easy insertion into the PDL. The width of the winged tips (1-6mm) have been shaped to match the size and shape of the tooths root. 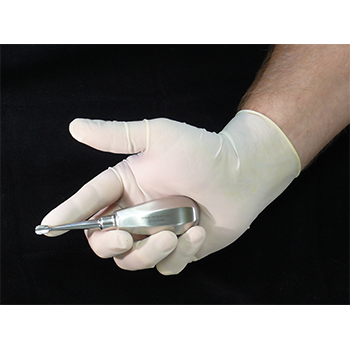 The stubby handle fits comfortably in the user’s hand (ideal for large or small hands) and allow the fore finger to be placed at the end of the instrument tip making extractions safer. Supplied in a black zipper pouch. The 1-6 mm stubby handle elevators fit comfortably in the user’s hand (ideal for large or small hands) and allow the fore finger to be placed at the end of the instrument tip making extractions safer. Supplied in a black zipper pouch. iM3 winged elevators combine the winged shape and thin sharp cutting edge to aid in extractions. The stubby handle sits comfortably in the users palm while the fore finger sits on the shaft of the instrument.